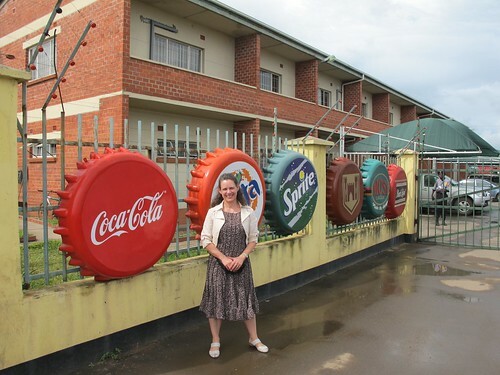 We knew that today was one of the most important of our trip as it included a meeting with three members of the senior management team at Zambian Breweries, a wholly owned subsidiary of SABMiller, and the bottlers of Coca-Cola in Zambia. But the start of the day was going to be a less daunting. We were off to see our friends at MSL (Medical Stores Limited). Our last trip kicked off with the meeting with the Managing Director of MSL and, looking back, set the tone for the whole visit – encouraging, positive, can-do. During our visit this time we were able to talk about aspects of a possible ColaLife pilot in much more detail. In the proposed pilot, MSL could distribute the AidPods to the wholesalers (at District level), although there are purely private sector alternatives, and they may also pack the AidPod Mother Kits. In the scheme of things, a ColaLife pilot would be very small beer for MSL but they are still willing to be supportinve and participate. We talked about their possible role in the delivery of AidPods in cartons to the pilot Districts and in the packing of the AidPods. An MSL representative will participate in the UNICEF-convened workshop on Friday. So that was a good start to the day. The only problem is that the battery in my Zambian phone had gone dead (not the phone’s fault but mine!) and I was anxious that I might be missing calls. When we got back to base I plugged the phone and we started looking again at our plans for the BIG meeting . . . . . when my phone rang. It was SABMiller asking if we could bring our meeting with them forward an hour. Three people from SABMiller attended the meeting: Chibamba who is the Corporate Affairs Director; the Sales & Distribution Director and the Marketing Director. We ran through the ColaLife idea and the top-level pilot design that we’d developed at the workshop we’d held during our first visit. This was received positively and enthusiastically and we got into discussions on the way Districts might be selected for the pilot and more. There is now no doubt in my mind that SABMiller are engaged but that they are enthusiastically engaged. We are hoping that SABMiller will participate in the Friday workshop and I was told that there would be absolutely no problem with me spending a day on a Coca-Cola truck next week so that I will be able to ‘feel’ the legendary Coca-Cola distribution system in action . . . . watch this space. Today we also received an invitation back to UNICEF tomorrow to discuss the monitoring and evaluation aspects of the pilot. So at 9am we will back at the UNICEF offices. In the meantime, the responses to the invitation to the Friday workshop are encouraging. I think that all the key players will be there.